The Ladybird Book Learning to Sew was published in 1972 and is from my favourite Series 633 - Hobbies. The book contains a variety of sewing projects that a child can complete, beginning with a simple table mat and progressing on to little gifts like pin cushions and comb cases, as well as practical skills like sewing on a button and turning a hem. I remember making simple table mats like this at school, in fact I think I still have a couple somewhere. The book has all sorts of different stitch designs, with examples of ways to use them in projects. I'm not that good at sewing and I found the instructions for the projects quite vague in places without the step by step guides that I'm used to seeing on crafty blogs. I think that the book probably assumes that there will be a handy mother or grandmother on hand to help. While most of the projects in the book are quite traditional, I really like the last two. They are collage pictures made using all sorts of bits and pieces, for example nuts or washers from father's tool box! This week Mia and I made these simple Valentine's Day cardboard collage photo frames. 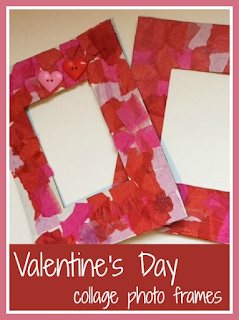 It's a really simple craft even for little ones, and would make a great gift for a loved one on Valentine's day. Scraps of red and pink tissue paper, coloured paper, napkins and so on. I very rarely buy tissue paper, I save it up when I receive it in packaging! First prepare all your materials - I began by cutting my frames out of the cardboard. The frames are quite large compared to the size of the photograph, so there is plenty of room for collage and decorations. They measure about 20cm x 26cm. For the hole in the centre I placed my photograph on the back of the frame and drew around it, then cut the window out with a craft knife to make it slightly smaller. Then I gathered a selection of red and pink tissue papers and tore them up into small squares. I laid everything out ready for Mia to get started. We used plenty of white glue on the frames and stuck on the pieces of paper. I tried to cover the whole frame in a Decopatch fashion, and so Mia copied me, she did a really good job! When the glue was dry I folded over the larger pieces of paper and trimmed the edges to make them look neat. The photographs are secured to the back of the frame using washi tape so they can be easily removed and changed. If you don't have washi tape, masking tape would work well too. They can then be hung with BluTak or you could thread some string through to hang from a nail. We embellished the frames with a couple of heart shaped buttons each. Mia was so proud of her frame and there is no question of giving them away, she insists that they are going to be on display in her room! This activity made me realise that I don't often do crafty things just with Mia, we tend to wait until Harry is home as I don't want him to feel left out. But we had such fun together, that definitely needs to change! In May 2014, the New Fantasyland area at Disney World Resort in Florida was completed. The expansion started in 2011, and on our previous visits to Disney World we've seen new areas of the park opened, and watched the building of the new roller coaster ride, the Seven Dwarfs Mine Train. On our recent visit in November 2014 we were excited to visit and see the whole of the New Fantasyland open. The Seven Dwarfs Mine Train opened in May 2014 and has been very popular. The new FastPass+ system at Disney World allows you to book your Fast Pass tickets 30 days in advance if you are staying off-site. Hotel Guests are able to book their tickets 60 days in advance, and as off-site visitors we found that by the time we were allowed to book, all the tickets for this ride had gone. With queues throughout the day of up to two hours, the only realistic way that we were able to ride was to arrive before park opening and when the gates opened speed walk to the ride to join the queue. We only managed this once, and our wait was about 20 minutes. Luckily, like all of the other newer rides, Seven Dwarfs Mine Train has a very well designed queuing area, with a few interactive games and activities for children to keep them entertained while you wait. In fact, the new and improved rides in Fantasyland are all very well designed when it comes to waiting in line. The best queuing area is at Dumbo the Flying Elephant, where children can play in an indoor play area while you wait for your pager to buzz and announce your turn to ride. The Journey of the Little Mermaid and The Many Adventures of Winnie the Pooh also have excellent waiting areas with interactive games to play. Luckily we usually manage to plan our day with minimal waits but I can see how this would really make a difference to the queuing experience when you have little ones. 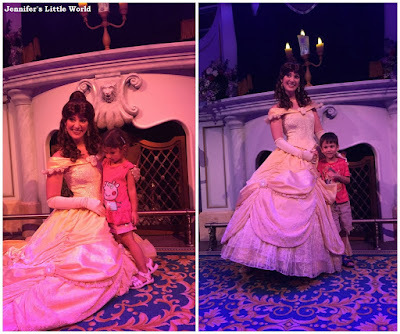 A new Fantasyland attraction that we hadn't managed to visit on our previous trips was Enchanted Tales with Belle, as again it is so popular that it has a very long wait within minutes of the park opening. This time we were able to visit as we had booked our Fast Passes in advance. You are taken through the attraction in small groups, and volunteers are chosen to play different parts in a simple story that is performed to Belle. At the end there is the chance to meet with Belle and have your photograph taken. We don't usually do the character meet and greets as they take up too much of the day, so it was a nice opportunity for the children to see a favourite character close up. A picture of them together would have been nicer of course, but Harry was too nervous to approach Belle until he saw that she was handing out bookmarks, and luckily that was enough incentive for him to pose for a photo! I hope that you enjoyed my little glimpse into the New Fantasyland! This week for Ladybird Tuesday I have another book from Series 633 - Hobbies. Easy-to-make Puppets was published in 1973 and features instructions for a variety of different puppets, as well as ideas for scenery, props and even a simple puppet booth. The book begins with a basic elephant puppet made from a thin sheet of card through which you post your finger to make the elephant's trunk. The book then carries on with ideas for a huge range of different puppets, made from household items including plastic bottles, handkerchiefs, apples and yoghurt pots. The designs are all simple, and yet some are really clever! The puppets increase in complexity as you progress through the book, finishing with papier mache moulded heads and handsewn glove puppets. You could put on a really professional style puppet show with some of these. The puppets in the book tend to focus on characters that featured in children's games and stories at the time, like Red Indians and robbers. Nowadays as well as traditional fairytales children would probably enjoy making puppets for their favourite Disney films and television characters. 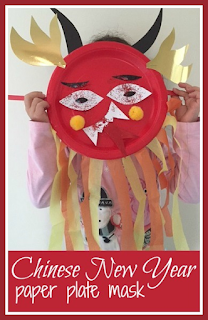 I know that my children love printing out pictures of their favourite characters and sticking them to lollipop sticks to make very simple puppets, and now I'm inspired to try something a bit more complicated! As you can probably imagine, I spend a fair amount of time ironing Hama beads (also known as Perler or melty beads). During that time I've picked up a few tips and tricks so I thought I would share them! I'm afraid I have no advice when it comes to actual irons, as the only thing that gets ironed in this house is the Hama beads. We do have a half decent iron as it came free when we bought our washing machine, but I wouldn't have thought it makes much difference. I use the medium setting on the iron (two blobs) for the more common midi beads. For the mini beads I use the lightest setting (one blob) as they are tiny and melt very easily. 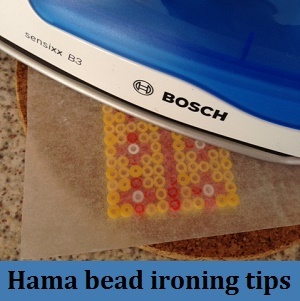 It's best to iron the beads on a firm, flat surface - I use a cork heatproof mat placed on my kitchen work surface. Hama bead kits come with ironing paper, and you can also buy it separately. You don't need the special paper though as you can just use normal baking paper, and you can reuse the sheets quite a number of times. It's best to discard the paper once the surface has started to go white in places, as then it can start to stick to the beads. You do need to use paper when ironing, I can imagine it would be quite messy if you didn't! I wait until the iron has heated up, then iron the design through the paper, moving the iron around as I go. As they melt, the colour of the beads starts to appear through the paper, and then you know that they are ready. If you iron too much it becomes very difficult to remove the beads from the pegboard. So if you want the design to be firmly fused together it's a good idea to remove it from the pegboard as soon as the beads have stuck together, and then iron again without the pegboard underneath. Larger designs in particular can warp as they cool. To prevent this, as soon as I've finished ironing a design I place it between two cork mats with a weight on top for several minutes. I find that this works very well to keep it flat. The children and I love making things out of Hama beads, and we now have several shoeboxes filled with our creations. 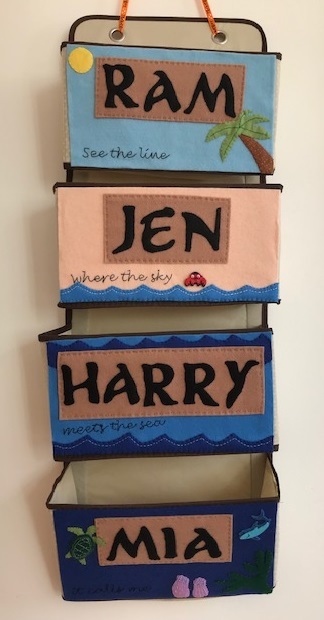 If you are looking for things to do with the Hama bead designs that you have made, I've written about some ways to display finished Hama bead projects. You can find all my Hama bead posts, including plenty of design inspiration, on my Hama beads page. Most people are scared of something, and most fears are pretty common. But according to a new poll by Benenden, 61% of the population admit to having some sort of uncommon phobia, with only 2% of them feeling unaffected by their fear. People taking part in the survey admitted to all sorts of strange fears. Some of them are fairly logical, for example I can relate to a fear of scaffolding as I'm often nervous when walking underneath, and I think many people are wary around some types of insect or moths. But it must be difficult to live with a fear of one of your body parts, like wrists, ankles or collar bones! It's also quite a sad sign of modern times that 8% admitted to being afraid of losing their phone coverage, although I've become so reliant on my phone that I do worry about finding myself without a phone in an emergency situation, or when needing to be contacted by someone looking after the children. 89% of those polled have never sought treatment for their fear, although there are various treatments available. Perhaps because they don't think they will be taken seriously, or don't feel that it has a great impact upon their everyday life. We have a digital display in the car that tells us roughly how many miles worth are left in the tank, and as it was running low last week I arranged that I'd put some more petrol in. But I'm embarrassed to say that when I got to the petrol station I panicked, stalled the car, and ended up driving quickly away! Meaning that a few days later I had another very stressful drive to the petrol station watching the miles remaining counter ticking down faster and faster, before reaching the petrol station with just 4 miles left on the display. Of course I managed to put the petrol in just fine, and now I'm more confident to do it next time, so perhaps the answer is to simply face these strange fears head on! Do you have an unusual fear? This is a sponsored post in associated with Benenden. The unusual fears poll ran for two weeks, and 771 people took part. A bit of an update on my Day Zero Project list. I'm afraid that I've been slacking a bit lately. It was an ambitious list, and although when I started it back in November 2012 it seemed as though I had all the time in the world, I've suddenly realised that I only have until August this year to complete everything! I'm not sure how likely that is going to be, so I'm not going to beat myself up if I don't tick everything off, but instead reflect on how much I've enjoyed taking part in it! The challenge to Read 20 Books Recommended by Others was one of the first that I started, knowing that it was a long term one. I asked for book recommendations across various social media channels, and ended up with a long list. I started reading ones that were easy to get hold of, and tracked down other ones that I liked the look of. I'll be honest that I did pick and choose the books, but I still read plenty that I wouldn't have otherwise. I've included in the list books that I was sent to review, in particular as part of the BritMums book club, as I felt that this falls into the scope of the challenge and I only have so much time in the day available to read. I found some fantastic new books, and there was only one that I didn't get on with and couldn't finish. I also didn't get through the entire list of suggestions, so I have more waiting when I'm looking for inspiration to read! 1 - Shades of Grey - Jasper Fforde (Anna). 2 - Freakonomics - Steven D. Levitt and Stephen J. Dubner (Joanne). 14 - The Passage - Justin Cronin (Alistair). This was the one that I couldn't finish unfortunately, although I gave it a very good go. It had an interesting plot but I just found it too long. Do you set yourself reading challenges? I'm finding that I have more time for reading now that the children are older and so I'm wondering if I should come up with something new to challenge myself with. For this week's Ladybird Tuesday I'm looking at another of the crafty Ladybird books that my Mum bought me for my birthday. More Things to Make is from Series 633 - Hobbies. It is a sequel to the original Things to Make book, and the Hobbies series has to be my favourite Ladybird series. More Things to Make was published in 1973. In total, the book features 24 different projects, with the majority themed around special occasions. There are a selection of cards and gifts for Mother's Day, some Easter crafts and some Christmas projects. The crafts use materials that are easily found around the home, for example toilet roll tubes, felt and pipe cleaners. A quick flick through resembles my Pinterest home page, with timeless children's crafting staples like tissue paper flowers and a pom pom cat. 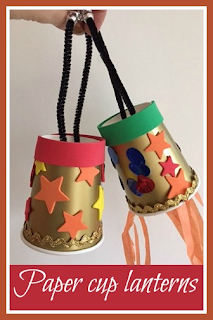 Most of the crafts are quite simple and could easily be completed by a child on their own. Some of them require a little more ability, for example hemming the edge of fabric, but the pictures are clear enough that even young children could use them as inspiration for their own ideas. I'm going to leave it around near Harry for him to browse through and see if he asks to make something from it, and if he does I will share it! Since our last visit to Orlando, the Wizarding World of Harry Potter has expanded to the Universal Studios park. I wrote about our visit to the Wizarding World of Harry Potter at Islands of Adventure a couple of years ago which we really enjoyed, and as a fan of both the books and films I was very keen to visit the new Harry Potter area at Universal Studios. 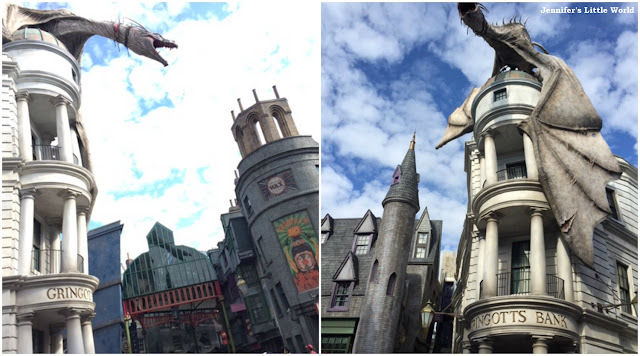 So the Harry Potter world now features in both parks. 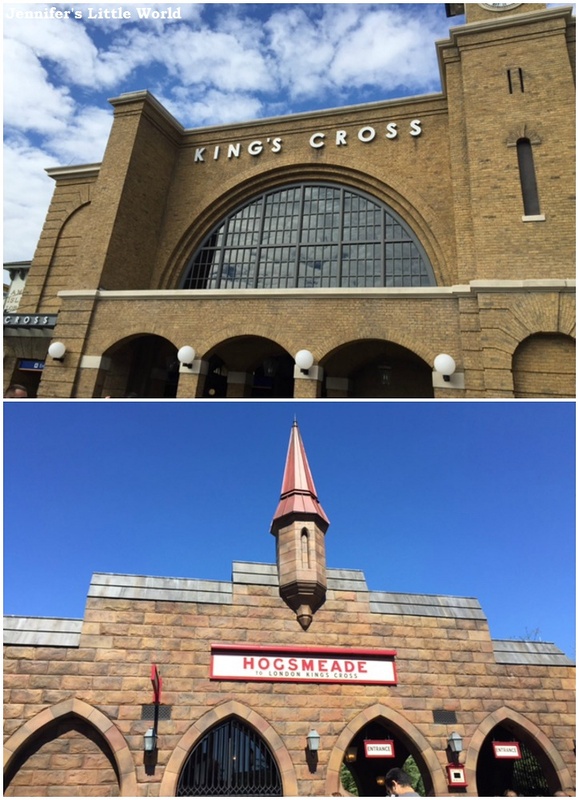 While Islands of Adventure has Hogsmeade and Hogwarts (in an area that opened in summer 2010), Universal Studios now has London and Diagon Alley, with both parks being linked by the Hogwarts Express ride. This area opened in summer 2014, and in Diagon Alley you can find the entrance to the new ride, Harry Potter and the Escape from Gringotts. You are first welcomed to muggle London (you know it's London because the rubbish bins say so), or at least a very clean, sunny and traffic free London, filled with people dressed in lighter clothing than is usual in real London (although with quite a number in wizard's robes!) This area of the park was surprisingly quiet, and while it may not be exactly true to life it certainly evokes a sense of London, albeit a rather smaller version, with some lovely architecture and detailing. 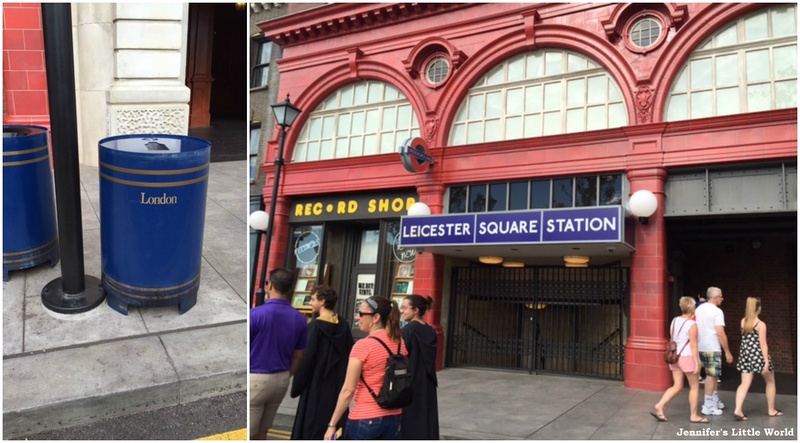 Behind Leicester Square Station you will find the entrance to Diagon Alley, home of wizarding shops and delicious butterbeer. There is lots to see here, and plenty to keep fans of the books and films happy, I'm sure that we didn't even see half of it. There are loads of little shops, some are just fronts and some you can go inside. There is regular live entertainment, along with places to eat and drink. I loved the scarf that was "knitting" itself in the wool shop. Although it was busy, it's fairly spacious so there is room to move around and see as much as you want to. We all had some butterbeer, which we remembered fondly from our previous visit to Islands of Adventure, although personally I find it rather too sickly sweet and I can't manage an entire cup! You can buy other butterbeer variations, like frozen butterbeer and butterbeer ice cream, as well as a few British snacks like packets of crisps and chocolate bars. The dragon above Gringotts breathes real fire from time to time, so if you are hanging around for any reason it's worth waiting nearby to watch it! Escape from Gringotts is the new flagship attraction at the Universal Studios Wizarding World of Harry Potter. It's a 3D roller coaster ride, but the attraction is more about the 3D projection screens along the way that really make you feel as though you are a part of the action. It took us several attempts to ride, and we only actually managed it once. The reliability of the ride isn't great, and as it seemed to be shut fairly often, the queues built up and were always long. Like Harry Potter and the Forbidden Journey at Islands of Adventure, a large part of the ride is actually the substantial queueing area which takes you through Gringotts Bank and past several theatrical presentations which are technically very impressive. You can still join the queue to experience this even if you don't want to actually go on the ride - we queued up as a family and then my Mum waited with the children in a special waiting area while the rest of us rode. We enjoyed the ride, but didn't feel the need to ride it again. It's not really a roller coaster - although it does throw you about - it's all more about the special effects. So while it's fun to experience once, especially if you are a fan of the books and can appreciate the huge amount of effort that has gone into making it an authentic Harry Potter experience, it's not the same as a roller coaster that you would ride again for the thrill of it. The new Hogwarts Express ride links the two Harry Potter themed areas at the different parks. In order to board the train at one station you need to have a ticket for the other park, so you will need a two park ticket. The King's Cross station queuing area is huge, but it's really well themed so the wait doesn't feel too long. It takes a while to unload and load each train, but each one can accommodate a lot of people and they arrive regularly. There is supposed to be a cool special effect as you walk through the wall at platform 9 3/4 but we completely missed it, so if you are visiting then do keep a closer eye out! You ride in a train carriage compartment with eight seats, a window on one side and then doors which shut you in on the other. The window is actually a screen which immerses you in your journey, and because the ride is different depending on whether you are departing from London or Hogsmeade you really need to ride it twice, once in each direction! The whole thing is very well done, and there are some clever tricks, like shadows of the characters passing along the train corridor outside and even tapping on your door. If you have a pushchair you need to fold it for the journey, and if your child is able to walk I'd recommend carrying it up and down the stairs at the stations rather than waiting for the lifts, as waiting can lose you quite a bit of time in the queue. It's a bit disorientating to find yourself in the other park when you exit. Each Harry Potter area is at the far end of each park too, so if this is your last attraction for the day, as it was for us each time we rode it, you then have quite a walk back through the park to the main entrance and car park. I'm really glad that I had the opportunity to visit, it's a fantastic new addition the park and definitely made our visit to Universal Studios worthwhile.